The Behringer ULTRABASS BXD3000H Bass Guitar Amplifier Head has been designed with the discerning bass player in mind and comes equipped with a range of pro-level features. The Behringer ULTRABASS BXD3000H features a 300 watt Class D amplifier that succeeds in combining incredible power and performance with an ultra-compact, lightweight design. This is joined by two different channels – Clean and Distortion –that both feature dedicated gain controls and, in the case of the Distortion channel, Shape and Level controls as well. Switching between both channels is incredibly easy thanks to the front-panel button and included dual-function footswitch. 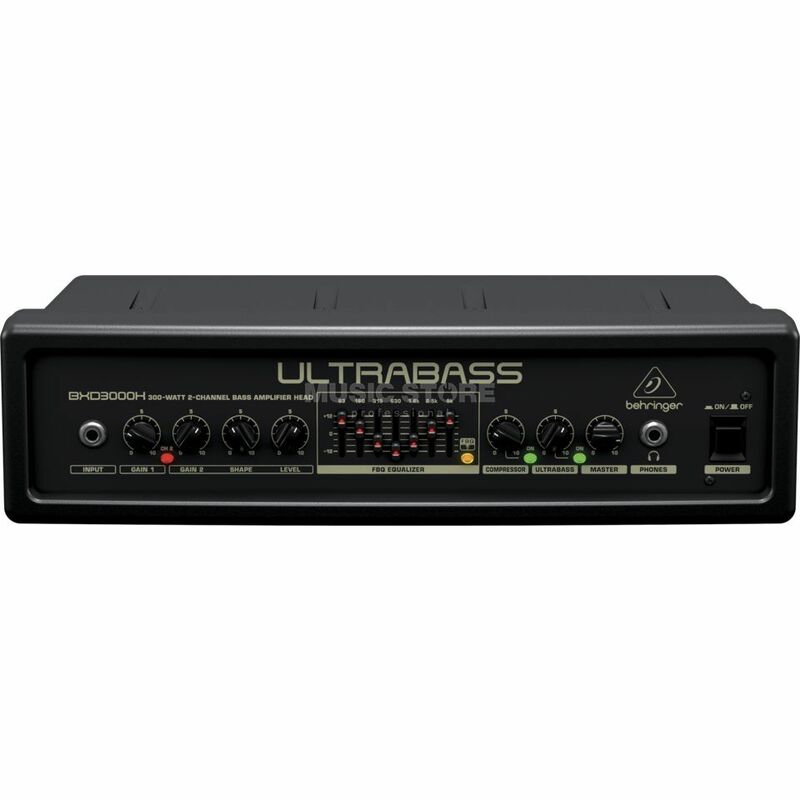 Accompanying the channel structure of the Behringer ULTRABASS BXD3000H bass amp head is an active seven-band EQ that features the brands proprietary FBQ technology. When operating in normal mode, this acts as a standard seven-band graphic EQ, but when the FBQ function is engaged, each slider lights-up to show which frequency needs adjusting for optimal performance. Finally, the Behringer ULTRABASS BXD3000H bass guitar amp head is equipped with an on-board limiter and switchable compressor that prevents the amp from clipping and emphasises every subtlety of what is being played, and a foot-switchable ULTRABASS processor that adds a signal one octave below the original played note.